A significant amount of money and energy is spent globally on leadership development each year, indicating its importance. It is well known from the literature and current research that effective leadership plays a significant role in limiting staff turnover, enhancing quality-ofcare and more importantly improving patient outcomes. There is also a recent focus on leadership within the Middle East evident through a recent publication Leadership Development in the Middle East by Metcalfe and Mimouni. Leadership focus was also apparent in the 3rd ADMC Nursing Conference, held in October 2012 in Abu Dhabi, and the Leaders in Healthcare Conference in January 2013 during Arab Health in Dubai. There is an extensive body of literature available in relation to leadership characteristics, behaviours and styles and an anecdotal belief that they are picked up and honed through experience. However, addressing the question of how leaders learn to lead within a particular healthcare context appears to be rare. Within heatthcare many formal leadership positions are taken by clinicians from a medical-, allied health-, and nursing background. Many of them have not been exposed to any formal management and leadership education and training, but rely on their clinical expertise to lead. 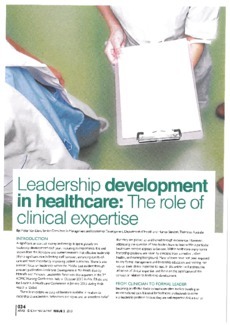 In this article I will address the utilisation of clinical expertise, and focus on the significance of this concept in relation to leadership development.